Every year, a new trend seems to hit the smartphone market, and if it isn’t large displays or gold color configurations, then it’s the manufacturers’ new found love for a curved display. Naturally, Samsung was first to the draw with the Galaxy Round, closely followed by its compatriot LG with the impressive G Flex, and although an iPhone featuring an angled panel would seem quite a way off right now, a newly-awarded patent suggests that the Cupertino company is very much considering it. Patent filings and subsequent awards are, as we know from history, not a stone-wall indicator that a new product or feature is nigh, and since Apple is famous for holding off on new technologies for many years before implementing them into its own product ranges, the chance of a Galaxy Round or G Flex-like device hitting the market from Apple any time soon would appear slim. But today’s granting of a "curved touch sensor" at the US Patent and Trademark Office shows that Apple is thinking with the times, and offers numerous details on how a curved display may be created while still maintaining high standards. At present, these kinds of panels tend to be rather flimsy and susceptible to damage when being created, and so rather than jump the gun by adding a flexible display to a new product, Tim Cooks company has taken to the proverbial drawing board in an attempt to work out a solution. 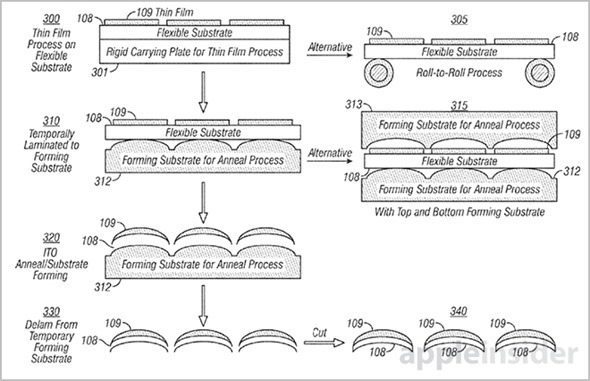 The workaround involves adding a layer of film atop a flexible substrate while flat. The pattern created can then be connected to a flexible substrate, and when heated, the substrate can be curved into different states without affecting the integrity of the display. Naturally, we would expect this kind of tech to be used with smartphones, but Apple’s patent also hints that we could see this in such features as touchpads and mice. It’s pretty exciting stuff, it has to be said, but unfortunately, as aforementioned, it’s also probably going to be quite a while before we see any of this in action, if at all. We all expected NFC of the iPhone long before now, and it still hasn’t arrived, and given how curved / flexible displays are brand new in the consumer market, it could be four or five years before a product based upon this patent is released – if, indeed, at all.